Which style of Slip-On Dancer® should I get for my floor surface?Carpet or Rubberized floors - the Carpet Dancer™ style makes dancing on carpeted surfaces easier. Carpet Dancers™ were very popular at the 2010 Convention in Orlando that was held on carpet. Wood, Linoleum or Smooth Concrete floors - the Smooth Dancer™ style work best on smooth surfaces like hard-wood or Linoleum floors. Which side goes up: ribbon or elastic? The ribbon goes up. We buy durable elastic that can withstand the friction that is created by stepping and spinning on the shoe. With the ribbon side up, you can personalize your band with paint pins or a Bejeweler. The elastic portion of the band is denser than the ribbon and can better handle the friction. Wearing the ribbon side down will shorten the life of the product. Would they fit on men's or kids' shoes? Slip-On Dancers® will fit all adult running shoes with heavy treads. If your shoes have a smooth bottom or you have small feet, the Slip-On Dancers® may work themselves off your shoe more easily.We have two styles: the standard 1.5" Slip-On Dancer and the 3" Slip-On Carpet Dancer™. Because men typically have a shoe surface that is larger than a woman's shoe, they may appreciate the 3" Slip-On Carpet Dancer. The current design is not recommended for use on childrens' shoes. How long will my pair of Slip-On Dancers® last? That depends on how you use them. If your dancing surface is a smooth, waxed wooden floor, the bands should last 70-90 classes. If you dance on carpet, the band will not last as long because there is more friction between the Slip-On Dancer® and the floor surface. Wearing the ribbon side down will shorten the life of the product. To prolong the life of the elastic, make sure to rinse in cold water every 4-6 classes. The elastic will shrink back to its original length when put in cold water. Will the Slip-On Dancer® be comfortable? Yes. The elastic is enough to hold the Slip-On Dancer® in place but is not strong enough to be uncomfortable. Why are Slip-On Dancers® being used by World Class dance teachers and students alike? Simple- it beats the other alternatives. The Slip-On Dancer® was the first traction modifier specially designed by a University scientist and Dance Fitness Instructor to make tennis shoes easier to use in fitness classes that require shoes to slide across the floor. The Slip-On Dancer® is the only traction modifier that will easily convert your regular aerobics shoes into dancing shoes. The bands keep falling off, what am I doing wrong? The bands are designed for use with walking/running/cross trainer shoes with large treads. Make sure the band is between the widest part of the shoe and your arch (ie the ball of your foot). 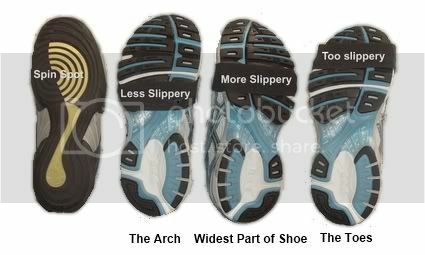 If you are wearing shoes that do not have large treads, the bands may move more, but should stay on. If the band works it's way down under your toes, make sure to pull it back on so that your shoes do not become too slippery. Why is Latin dancing in Cross Trainers or Running Shoes difficult and may be bad for my knees? Most Cross Trainers and Running or Walking Shoes have large 'grips' in the ball of the foot providing traction, which is needed for activities like running or kick boxing. In Latin dancing, however, there is more hip movement. If the foot stays gripped to the floor because of the shoe tread, the knee can be twisted. Even if no knee damage is sustained, your hips are constantly fighting the floor, and your range of motion suffers. Stretch the elastic wide to go over the treads of your shoe. Grab the back and pull them on like a sock. Sometimes putting the Slip-On Dancer® on the shoe before you put the shoe on your foot is easier. Be sure to stretch the elastic and try to avoid stretching the stitching at the seam. How much control do I have over the traction? For Latin dancing, the ball of the foot serves as a pivot point for many steps. Turns happen when the weight is in the ball of the foot. Cover up these key treads in the ball of the foot using the Slip-On Dancer to have the least grip. For more traction, move the Slip-On Dancer® further towards the arch of the foot to uncover the treads in the ball of the foot and allow them to grip the floor. Because the majority of the treads are still able to grip the floor, your feet will not slide out from under you as they will with some dance shoes with no grip at all. Do you have volume discounts?Yes. We do give volume discounts to gyms or instructors wishing to sell the bands or provide them for their class. Please contact Orders@Slip-Ons.net for more details.